Throughout the campaign, I will be profiling some of the ridings to watch. 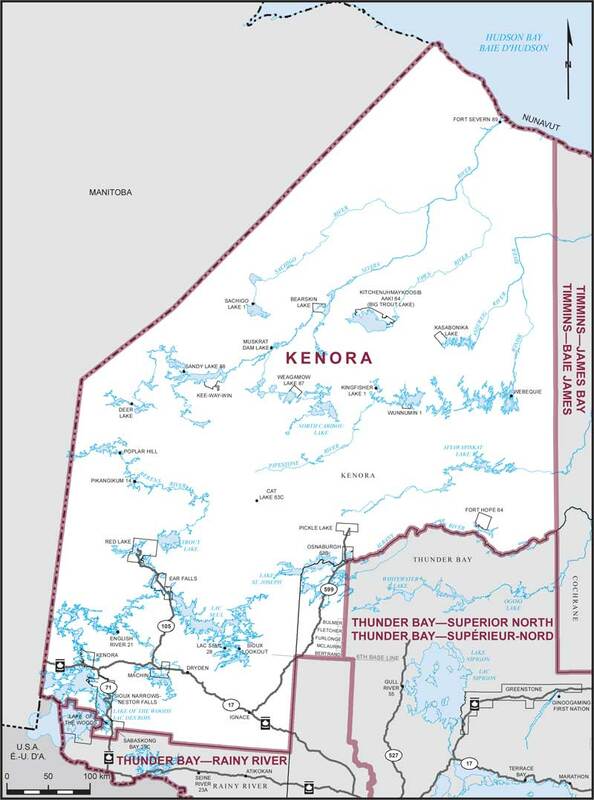 Today's selection: the northwestern Ontario riding of Kenora. 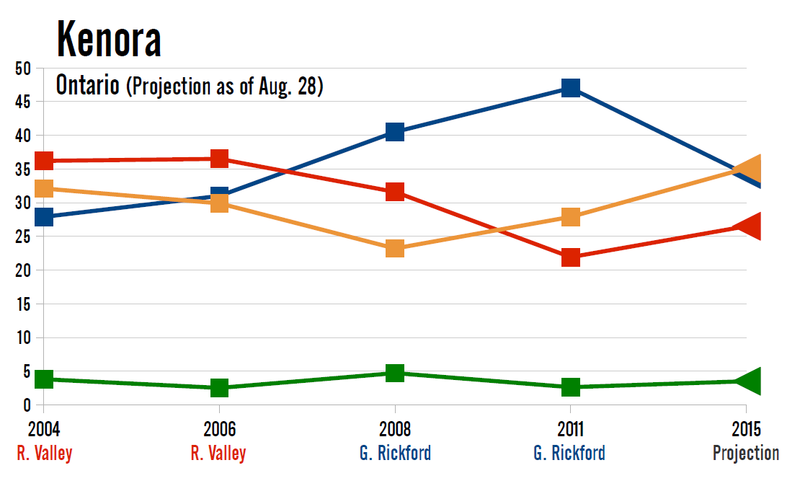 Though it was a comfortable win for the Conservatives in 2011, the riding of Kenora has been a close race in the past. It was a veritable three-way contest in 2004 and 2006, when the margin between the first and third place candidates were 8.3 and 6.6 points, respectively. The Liberals eked out wins in both cases, first against the NDP in 2004 and then against the Conservatives in 2006. Greg Rickford won the riding from the Liberals' Roger Valley in 2008, and widened his advantage in the 2011 election. It that contest, Rickford captured 47% of the vote, with the NDP's Tania Cameron finishing second with 27.9% of the vote. The Liberals fell to third with just 21.9% of the vote, while the Greens came off a high of 4.7% in 2008 to drop to just 2.6%. There was a big swing between the Liberals and the Conservatives between 2006 and 2011. The Liberals dropped just under 15 points, while the Conservatives picked up 16 points. Voters, then, seemingly moved directly from the Liberals to the Tories, by-passing the New Democrats. Rickford won the southern portion of the huge riding in 2011, where most of the population lives. He won the polls in Kenora handily, as well as winning Dryden by a fair margin. Aside from a few individual polls here and there in the south, the Liberals and New Democrats only won the sparsely populated north. 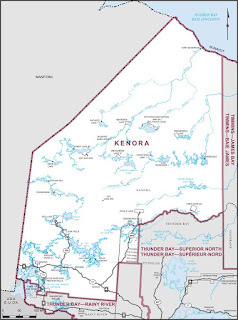 If either party is to have a chance to win the riding, they will need to make gains in Kenora itself. All three parties are gunning for the riding. Rickford is the incumbent, and a cabinet minister to boot. When parliament dissolved, Rickford was the Minister of Natural Resources. The New Democrats and Liberals have put forward strong candidates of their own. Most interesting is Howard Hampton's candidacy for the NDP. Hampton has a long political history in the riding. He represented the provincial riding from 1987 through to 2011, serving as a cabinet minister in Bob Rae's government (as Attorney General and, later, as Minister of Natural Resources). He was also the leader who replaced Rae in 1996, leading the party through the 1999, 2003, and 2007 provincial elections. He had his best performance in that last vote, when his Ontario NDP captured 16.8% of the vote and 10 seats. The Liberals are looking to their past as well, with former MP Bob Nault carrying the Liberal banner this time. Nault was the MP for the riding from 1988 to 2004, when he stepped down. Nault was a minister himself in Jean Chrétien's federal cabinet, occupying the post of Minister of Indian Affairs and Northern Development from 1999 to 2003. The Greens are running Ember McKillop, a Dryden school teacher. The current projection suggests this could be a very close riding, and potentially a three-way race as well. The NDP's Hampton is narrowly favoured with between 33.7% and 37.9% of the vote, which would represent his party's best result since the riding was created in 2004. Rickford is a close second with between 32.5% and 37.6% of the vote, which would be his party's worst performance since 2006, when the Tories took 31%. The Liberals' Nault is projected to take between 23.9% and 28.4% based on current polling trends. This is an improvement over 2011's result, but well below Nault's and Valley's winning numbers in the past. The Greens' McKillop is projected to take between 3.2% and 3.8% of the vote. It is still early going, however. If the Liberals make some gains in Ontario, Nault could be quickly favoured in the projection. But a three-way race between three heavyweights can make for a very unpredictable outcome. The role of strategic voting could be significant: will voters currently splitting between Hampton and Nault go en masse to the party more likely to defeat the Conservatives? Or, if the NDP is leading nationwide, could the Liberals who voted for Rickford in the last few elections go back to the Conservatives to block the NDP? Keep an eye on Kenora. What is funny/sad is that the Libs & NDP will call on Green voters to not 'split the vote' and vote for their candidate. If the Libs & NDP were serious about kicking out the Conservatives they'd have talked ahead of time and decided who was going to run a star candidate. Instead they are setting it up for the Conservative. Still, despite that, given how much Hampton is loved up here I suspect he'll win. I was bored and crunched some numbers about were a majority government would come from (based on second place finishes). The Liberals can't reach majority levels. The Conservatives need: +13 in BC, +2 in AB, +5 in SK/MB, +27 in ON, +7 in QC, +6 in Atl, and +1 in the north; 29 seats from NDP and 31 from LPC, and all second place finished below 85% certainty. The New Democrats need: +4 in BC, +4 in AB, +1 in SK/MB, +15 in ON, +7 in QC, +3 in Atl, and 0 in the north; 20 seats from CPC and 14 from LPC, and all second place finished below 72% certainty. And now with the recession confirmed what will the Tories do ?? You mention Edmonton Centre "riding" and talk of "Party" standings. There are "candidates" in the riding affiliated with parties. People are voting for candidates (in reality) and party (by delusion).